In this day and age, there is no excuse to put up with poor TV reception or fuzzy pictures. With just one phone call, you can have technicians from a cable or satellite company come over to your house, run cables all over the place, and hook you up with a viewing package of your choice. But, what if you are not too keen on paying money every month to watch television? In that case, you can go for the cheaper, quicker, and easier solution of Indoor TV aerials. 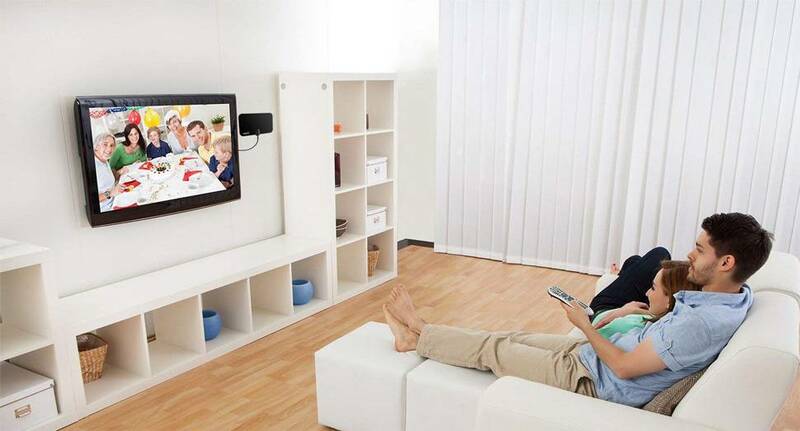 An indoor TV aerial is the best option if you simply want to watch Freeview channels. And, with the digital switchover having boosted Freeview coverage in the UK to 98.5%, indoor aerials are a very sensible option. In this guide, we’ll break down the key information of what makes a good indoor TV aerial, compare the specs of 6 of the best and much more. Let’s dive right in. Read indepth guides full of information and evaluate the pros and cons from 6 of the best freeview aerials. Do you watch football religiously? Is family movie night a regular thing in your home? Are you a TV-holic who likes to stay up-to-date with the latest news and hit series’? Did you answer yes to any of the questions? 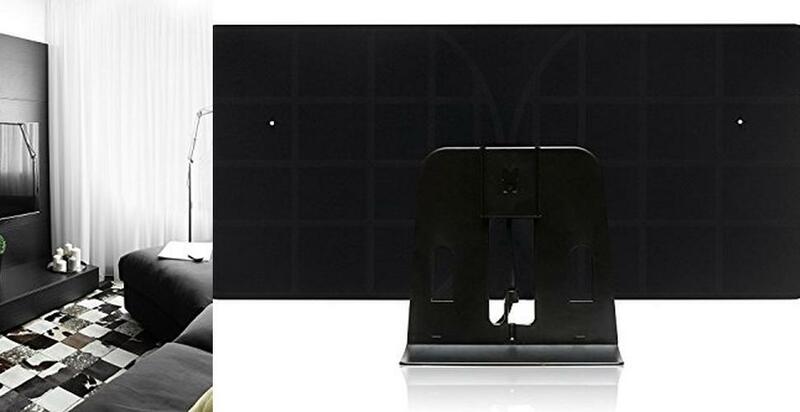 If so, the Morpilot Digital TV Antenna could be what you need to take your viewing experience to an all-time high. Designed to provide you with the highest quality content, this Digital Morpilot antenna pulls out all the stops with its list of features and included tech. 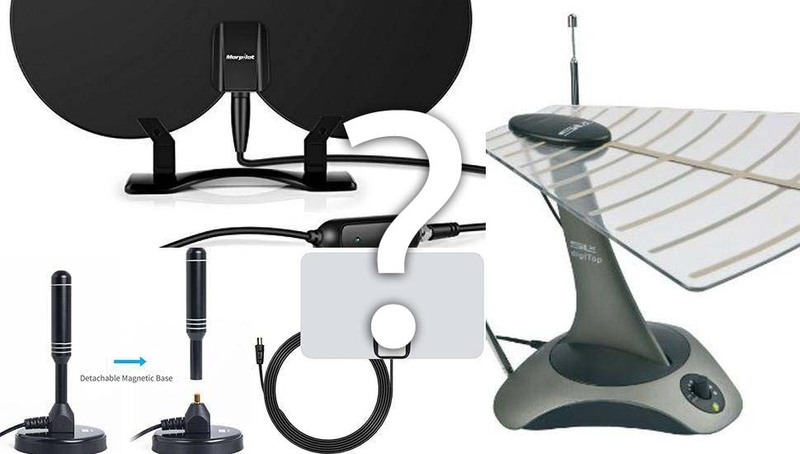 So if you are ready to cut the cable cord, this is one antenna you should know about. 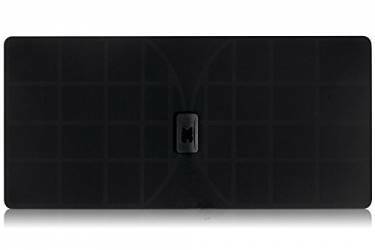 Although the Morpilot Digital TV antenna appears intimidating with its unique design of interlocking circles, it is very straightforward when it comes to setting up. The 26ft coaxial cable that extends from the aerial has an F-male end, which you will simply insert into the “ANT/IN” port at the back of your tv. If you live near a transmitter, this should be enough for your television to pick up the crystal clear 1080p HD reception that Morpilot promises. That is after you have located the best installation point for the aerial. But, between the paper-thin build of the aerial and the almost endless cable, which is more than twice the height of a standard door, you will not have a hard time finding the best reception spot in your home. For those who live in a bad reception area, the route to take will be connecting the cable’s end into the DC Jack of the intelligent power box/external amplifier that comes with the unit. The other end of the amplifier has jack and USB cables, which you will proceed to insert at the back of your TV and USB port (on TV or separate adapter) respectively. At 80 miles, the reception range on this unit is one of the best around. And that is not even including the unit’s built-in amplifier (with a gain of 28dB) which provides added reach to ensure your TV gets the maximum number of channels in relation to your distance from the available broadcast tower. For the best results, the aerial makers at Morpilot recommend placing the antenna on a window. For a tv fanatic, there is no better indoor aerial match than this. Where indoor aerials simply stop at capturing free-view local channels, this aerial goes the extra mile of also including popular network television in its range of reception coverage. 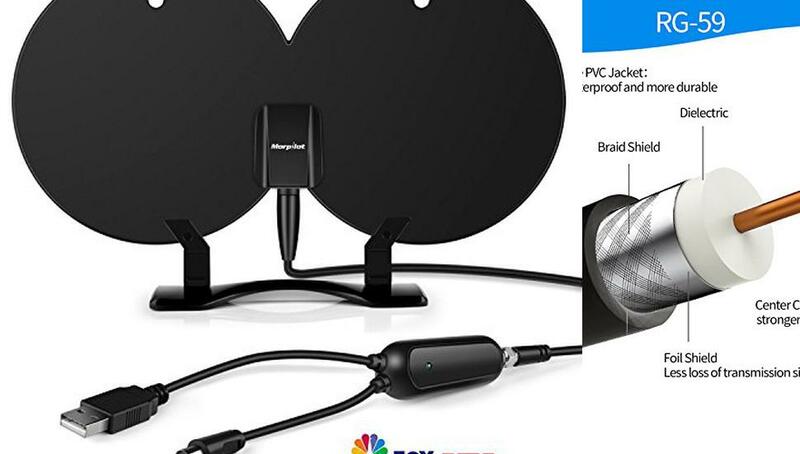 Depending on your location, BBC, CNBC, the CW, ESPN, FOX, NBC, HBO, ABC, and TELEMUNDO are just some of the popular channels this digital antenna will bring to your home. The aerial even automatically scans for new channels on a constant basis. Another thing that is sure to please with this aerial is that all available channels (local & others) are displayed in full HD quality. The aerial has inbuilt crystal clear filter technology that picks up signals and then isolates out cellular and FM signals to deliver clear pictures at all times. 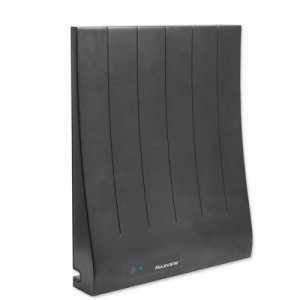 The Morpilot Digital TV Antenna is an aerial that blows several best buys (including the high bandwidth SLx DigiTop and the top-notch RGTech Monarch 50) out of the water. 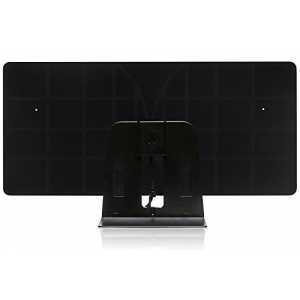 Its easy-to-handle design, durable build that is capable of holding up to outdoor elements, powerful 80+ miles reception range, not to mention ability to deliver both local and network television channels in high definition makes this Morpilot Digital TV Antenna a good value purchase from whatever angle you look at it. 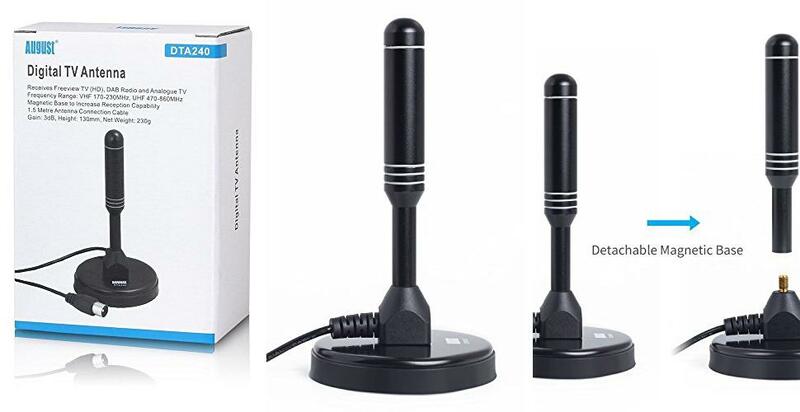 If you are a smart shopper who is always looking to land a good deal on an indoor aerial, the August DTA240 High Gain Antenna should perfectly meet your your buying criteria. 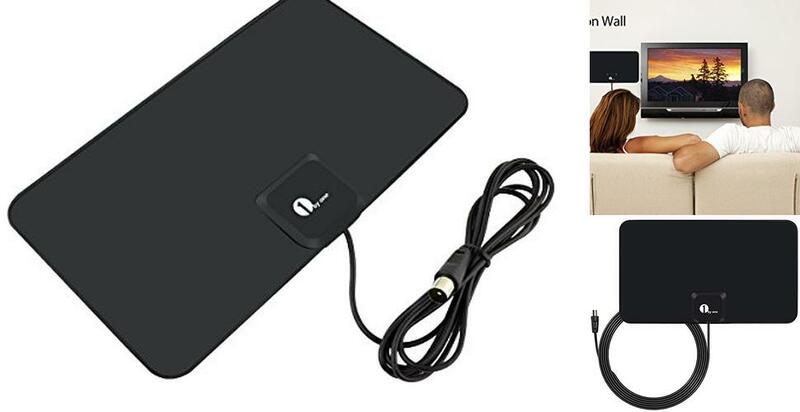 This TV antenna is a compact little thing that punches well above its weight with above average reception, Full HD & UHD potential, and high gain capabilities. And, at a ridiculously low price tag of under £20 (at the time of writing), the aerial also offers the advantage of being cheap. Learn about the August DTA240 High Gain Antenna in more detail below. Unlike some aerials around (e.g. the Morpilot Digital Antenna), the August DTA240 does not require an extra plug during installation. Just plug the unit’s standard coaxial cable into the back of your TV and that’s it. Another nice thing about the aerial is that it features a magnetic base. This doubles your installation possibilities as you can stick it on the fridge, windowsill, bed frame, or perch it up on a shelf or any flat surface. However, you should know that placing the aerial on a metal surface increases reception quality. A 50-mile reception range puts the August DTA240 at the top of its game. This is the same kind of reception you will find with a good number of higher priced units. This plus the antenna’s high gain design means the aerial works hard and can even capture tv (and radio) signals in weak reception areas. With this compact aerial, you should be prepared to welcome not just freeview television channels but also radio stations into your home. The frequency range covered by the aerial includes 174-230MHz for VHF and 470-860MHz for UHF. What’s more, the broadcast quality is great as the August DTA240 supports both 1080 HD and 4K UHD channels. Standard definition (SD) channels can also be captured by this aerial. This cute little aerial is a bit of a hit or miss depending on where you are located (i.e. distance from TV transmitter and surrounding environment). However, when it works, it works absolutely well. 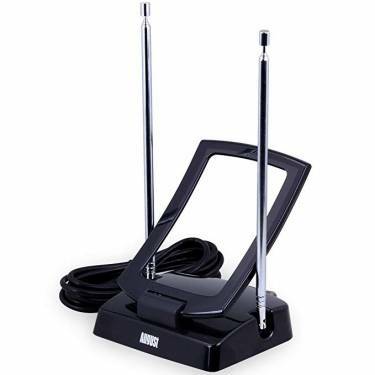 Its high gain design and magnetic base give the aerial a solid reception strength that works for many people even without the presence of powered amplification. 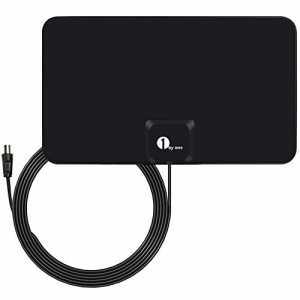 It’s neat little size, low cost, and indoor/outdoor build are also great qualities that make it a top contender for anyone looking to purchase an affordable indoor antenna. Looking at the paper-thin square piece of plastic that is the RGTech Monarch 50, you will not be the only person to feel skeptical about the device’s performance. You also would not be the first one to be pleasantly surprised. They say do not judge a book by its cover and that could not be truer for the RGTech Monarch 50. With a list of top-notch features that include a 50-mile range multi-directional reception, UWB technology, 4G filter, 15ft cable, and a stylish easy-to-mount design, the Monarch 50 is nothing short of an excellent product. And, with the antenna’s ability to deliver HD broadcasts (including 1080p and 4K), the best quality of the Monarch 50 is that it’s compatible with all digital-ready TVs. But, will the Monarch 50 be a good fit in your home? Find out more as we delve into more detail below. Like all indoor aerials, the RGTech Monarch 50 has a plug and scan design. Therefore, you can have it hooked up in as little as 2 minutes. The device has an easy push on F-connector, which you simply need to connect to the back of your tv. The reception will depend on where you set down the Monarch 50 and with the 15 feet worth of cable that comes with the aerial, you will have plenty of options on where to place it. Securing the device is also easy once you find that sweet reception spot. You have the option of using the clear double-coated removable foam tapes (for window and wall mounting) or assembling the aerial stand (good for tabletop mounting), both of which are included with the Monarch 50. Offering 50 miles of multi-directional reception, the signal strength of this unit is excellent. With this range, the Monarch 50 will traverse far and wide sometimes even through forests to bring Freeview television to your home without any fuss. The multi-directional range of the Monarch 50 is combined with Ultra Wide Band (UWB) technology, which will boost an already great reception by increasing bandwidth coverage. As a result, you end up receiving all the available over-the-air TV channels (including those in HD) in your area, which are delivered in exceptional picture quality. A 4G filter is also included to ensure you enjoy this quality viewing without having to put up with interference from mobile phone signal transmitters. Impressive is the word that sums up the RGTech Monarch 50. Its ability to pick up signals in the face of obstructions is astounding while the image and sound quality is crystal. The Monarch 50 also gets high points for an affordable price of under £30 (at the time of writing). Therefore, if you live in an area where the reception is bad, we think this is the indoor aerial to go for. 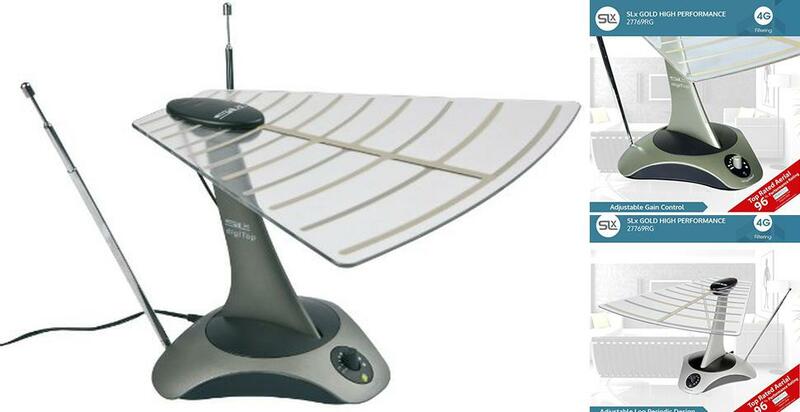 Looking for a cheap indoor aerial that will allow you to enjoy quality HD freeview TV viewing? Well at around £10 (at the time of writing), the 1byone 0.7 mm Paper Thin HDTV Aerial is as cheap as it gets. And, with a fast and easy set-up, omnidirectional signal pick up, and 50-mile range reception, the aerial does not fall too far down on the quality scale of indoor aerials. But, are these features enough to make the 1byone 0.7mm HDTV Aerial a good buy? Read on to find out. Although the 1byone HDTV aerial looks a little flimsy, this is actually by design. Thanks to its exceptionally thin build (even thinner than the RGTech Monarch 50), the aerial has a super light feel that makes it possible to stick it anywhere in your home (a wall behind a bookshelf, on a window, or even on a door with great angle to transmitter) and even take it on trips. At 3M, the cable on this aerial may not be the longest around but it should be more than adequate for most people. While the option of moving the aerial up to the attic isn’t possible, you still get a good range of movement within the space close to your TV after you have connected the IEC-Male end of the attached coaxial cable into the ANT/IN connector at the back of your television set. If your home is far away from a broadcast tower, that is just one more reason to buy the 1byone. Featuring a 50-mile reception range, the aerial has far better reach than other indoor antennas in its price range. The aerial is also omnidirectional making it a more attractive buy because it does not need to be specifically angled to receive and boost signals. 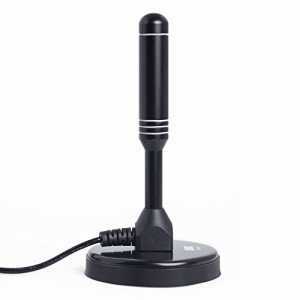 In addition to strong reception, this aerial has the built-in capability of capturing VHF, UHF, and FM signals as well as the potential of delivering full 1080 HD quality. So, you should expect a good number of channels (in HD and otherwise) with this aerial. And, if there are too many obstructions in your area, you can always buy the 1byone High Gain TV aerial booster to increase your chances of getting good reception. 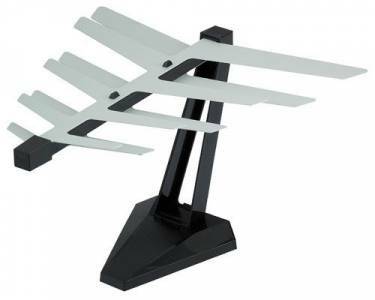 The aerial can match just about any décor as it is painted black on one side and white on the other. You can also paint the aerial whatever shade that best suits your home’s colour scheme. For the price and look this 1byone HDTV aerial has, it fares better than expected. 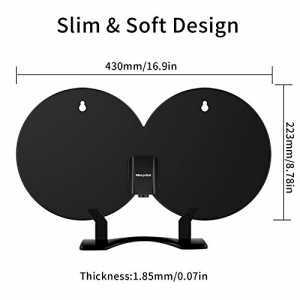 Its 50-mile range omnidirectional reception makes it a good fit for areas where TV reception is poor, while the thin lightweight build allows you to position the aerial just about anywhere. With the lack of a stand or adhesive tapes, you will have to get creative when securing the aerial in place. However, that should not be too hard thanks to its paper thin design. Log periodic aerials are known for offering a wide bandwidth of frequencies while rod aerials are unparalleled when it comes to receiving VHF channels. 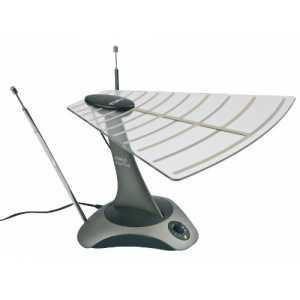 With the SLx Indoor TV Aerial, 27769RG you get the best of both worlds thanks to a unique design that features a combination of 2 rod antennas alongside a log periodic blade antenna. The idea behind the design is to provide a high performing aerial with wide frequency range. Due to its design, the SLx DigiTop Indoor TV Aerial has a setup process that is longer than your average plug and scan indoor antenna but easy all the same. To start with, the aerial requires some assembly because it arrives in 2 parts; a column supporting a UHF antenna blade and a base with VHF ‘rabbit-ears’ rods. Luckily, the assembly involves a simple one-step move of sliding the column part of the aerial into a slot on the base until a click sound is heard. For installation, there are 2 steps; The coaxial cable attached to the aerial goes to the back of your TV while the jack plug from the provided power adapter goes into the power socket at the back of the aerial (if you plan on using the amplifier). Unlike other indoor aerials, the SLx DigiTop does not require you to move the entire unit from place to place when searching for the perfect TV reception. Simply find a good spot where the signal is strong (windowpane, a high-up bookshelf, top of the TV, etc) and then adjust the aerial elements until you strike crystal picture quality on your TV. The UHF blade antenna can rotate as well as tilt over, while the VHF antenna rods feature a telescopic design that allows for 360° rotations. One huge advantage with the SLx is that the reception range on the aerial can be adjusted to a strength that is suitable for your area. A gain control switch sits at the front of the unit that allows you to adjust the aerial’s built-in amplifier. The range on the control gain stands at 16dB VHF + 16dB. You chances of receiving all the locally available freeview digital channels do not get better than the SLX 27769RG. Being a log periodic aerial in part, the SLx DigiTop has a wide bandwidth (470 -790MHz), which the included rod antennas only work to widen. As a result, any channel in the frequency of 30 to 790MHz (radio or TV), this aerial will capture. And, you do not have to worry too much about interference issues. The built-in amplifier allows you to adjust the aerial to optimum performance and an internal 4G filter protects from loss of channels or reduced picture quality brought on by LTE phone signals. If using an outdoor aerial is not possible where you live, the SLx 27769RG is a good alternative. It is easy to setup, adjusts to your needs, and provides excellent reception. Overall, an efficient aerial that is also affordable. Normally, using an indoor aerial with an amplifier in a strong signal area causes more harm than good. That is with the exception of the Maxview Contour Plus. Despite featuring an inbuilt signal booster this indoor aerial is designed for areas where the signal is strong. And that’s not the only unique thing about this indoor aerial. It features a one-of-a-kind solid, slab-like shape with curved edges that meander down to a wider base with excellent stability on horizontal surfaces. So, is this digital aerial’s performance as impressive as its interesting design? We discuss this and everything else you need to know about the aerial below. One area where the Maxview Contour Plus conforms to the norm is the setup process. Short and sweet, this process simply involves you plugging the end of the aerial’s cable into the respective port at the back of your TV and then moving the device to an area with good signal reception. Aside from a wide base that is great for positioning on a flat surface, the Contour Plus digital aerial also has recesses at the back that can easily slide onto a couple of screws if you decide to go the wall-mounting route. The Contour Plus also has an advantage over its fellow counterparts with an inbuilt amplifier. Since the aerial is battery operated, there will be no need to run extra leads to the mains (much like the August DTA240). Instead, you pop in 2 x AA batteries, hit the ‘on’ switch and a blue LED light will come on and flash regularly indicating that the aerial’s signal booster is at work. On average, you will get around 1000 hours of run-time before you’ll need to replace the batteries. One downside about the Maxview Contour Plus is that it falls a little short when it comes to reception range. Where other models with built-in amplifier feature gains of 28dB and 32dB, this aerial only offers a gain of 13dB with its signal booster. The reason for this little shortcoming; however, is because the Contour Plus digital aerial is designed to be used in areas where the signal is strong. This is another area where the Maxview Contour Plus fails to keep up with other competing indoor aerials. To begin with, you will need to live in an area with a strong signal reception to be able to get freeview channels using this aerial. The frequency range only covers f 470-860MHz in the UHF band. No FM, VHF or DAB coverage. The good news; however, is that the 470-860MHz range gives the aerial wideband status for UHF TV. Therefore, you will be able to get a good number of tv channels. The pictures also come in great quality, as the aerial is compatible with all digital TVs including 4K models. If you are looking for a flashy indoor antenna with the latest features, the Maxview Contour Plus is not it. With this indoor aerial, you will not find features like extensive bandwidth coverage, signal filtering technologies, or even radio reception. The Contour Plus is simply an indoor directional aerial (with the additional functionality of built-in signal booster) that is specifically designed for the reception of over-the-air broadcast television signals in the UHF band. To that extent, the Contour Plus works fine if the signal in your area is strong. The aerial also has a few nice bonus points in the form of a slim space-saving shape, flexible design that allows for both freestanding & wall mounting installation, and durable construction. You also need to decide what type of indoor aerial to buy. Normally, the aerial polarization of your area and personal preference are what usually dictate the final choice. That said, knowing the differences between each of the available types should help you make a wiser choice. So below is a quick rundown of the different types of indoor TV aerials. 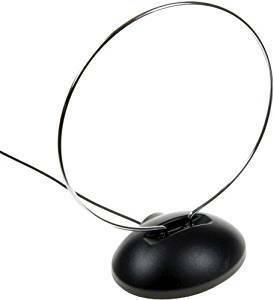 Remember the metal ‘rabbit ear’ antennas that would go on top of old-school television sets? Well, indoor rod aerials borrow from that design. They can have one or two pointy antennas that are usually omnidirectional or capable of shifting from horizontal to vertical polarization. One downside to rod aerials is that they are mostly designed to receive VHF channels. These are smaller versions of rooftop aerials. They come complete with aerial elements etched onto a straight rod. Thanks to the design, periodic log indoor aerials can be adjusted to vertical or horizontal polarization with ease. Log periodic aerials are also known for offering more consistent signal levels across all freeview channels and are great at resisting electrical interference. These are named so as they contain a circular loop in their design. Loop aerials are omnidirectional and will; therefore, work for both types of transmitters (i.e. vertical or horizontal signal polarisation). When it comes to performance, loop indoor aerials are considered to offer good sensitivity but do not usually get a hold of all channels. Consisting of flat square-shaped panels with loops and antennas folded on the inside, patch indoor aerials are the easiest to mount. They can go pretty much anywhere be it a flat surface or wall (some even doubling up as picture frames). Patch aerials too are omnidirectional and can; therefore, fit into most homes. With indoor TV aerials, you can stumble onto good signal reception in the most unexpected of places. This can be the wall above your TV, next to the kitchen window, up in the attic, or a bedroom that is at the far end of your home. For this reason, an indoor aerial needs to be very flexible when it comes to fixing it in place. Things like wall mounting brackets, window supports, clear stickers, and adhesive Velcro pads make it possible for you to secure your aerial wherever the signal takes you. Of course, you will not be able to go very far with your aerial if it has a short cable. So aim for one with a lengthy cable – the longer, the better. It will provide you with more options on where you can take the aerial thereby ensuring you will get the best possible reception. Do you use 4G mobile services in your home? If so, there is a chance it might cause interference with your indoor aerial reception. This is because the 4G frequency band sits right next to spectrum used for freeview digital TV signal. Luckily, many aerials nowadays come with inbuilt mobile interface protection to avoid this very problem. Sometimes even the very best of indoor aerials may not be able to provide good TV reception in your home. This may be as a result of external factors like the position of your house in relation to other buildings. So make sure that the indoor aerial you choose has a favourable return policy. Otherwise, you might just end up with an aerial you cannot use. A lengthy warranty is also great to have in case the aerial fails to work or breaks down due to an error in manufacturing. Aerials are certainly not the most eye-pleasing items to look at. Much less when installed inside the home since they can throw things off balance in a well-designed room. A good way to avoid this is to look for a decent-looking aerial that can blend in with the décor of your home. A small and lightweight aerial is also a good pick as it is less intrusive and can be made less noticeable by being placed alongside items on a shelf or sideboard. A small aerial can also easily go on a blank space on the wall preventing it from cluttering up your home. This step is quite easy and only requires you to plug your aerial’s cable into the back of your TV or the set-top box you will be using. All indoor TV aerials come with a manual, so you will still be able to plug in yours even if you are the least technical person on the planet. Next step involves positioning your aerial at the best possible spot with excellent reception. For this part, you will need to tune your television to a well-known free to view local station and start moving the aerial around the house until you get a clear picture and good sound quality. Start with areas next to windows, as this is where aerials typically work best. Opt for head height positioning to keep the aerial out of the way. You should avoid areas around a central heating boiler and electrical switches, appliances, or motors. Electrical interference, also known as impulse noise, can cause serious TV reception problems. Once you have found the optimal position for your indoor aerial, scan through the rest of the available channels to ensure all of them also have a clear picture. Feel free to continue moving the aerial around until you stumble on a position that shows a clear picture on most if not all channels. After everything checks out, secure the aerial in place with tacks or adhesive tape and start enjoying your freeview TV. If the picture on your TV keeps breaking up and the sound is poor, it is most likely that your aerial is not pointing directly to the transmitter. A neighbouring building, tree branch, or even a neighbour’s rooftop aerial could be getting in the way. In this case, you will have to move the aerial to an area with better reception. Aim for a higher location with a clear unobstructed line to the transmitter. Another common cause of reception problems is interference from devices within your home. So check for phones, walkie-talkies, Wi-Fi routers, baby monitors, cables, and wires and move them as far away from the aerial as possible. In fact, anything that is on a frequency needs to be a long distance away from your indoor aerial as it can interfere with reception. There is nothing more frustrating than when channels which were previously there in crystal clear quality just go missing from one day to the next causing you to miss out on your favourite show just when things were getting good. With this scenario, the way out is to re-tune your digital TV or box. Free to view channels can often keep changing with some being added and others re-moved/moved. Re-tuning your tv from time to time will help you keep up with the latest channel line-up in your area. If the nearest tv transmitter from your home is a long distance off, you will need a really strong aerial. And if the aerial does not work, using an aerial amplifier or signal booster can strengthen an aerial giving it more power to pick up a signal from a far off transmitter. Some aerials, however, come with an in-built amplifier in which case the situation will need to be approached from a different angle. If the signal strength in your area is strong and you use an aerial with built-in amplifier, the TV tuner can get overwhelmed resulting in loss of signal. Reducing amplification power of the antenna via the unit’s gain control can help even things out giving you good signal reception. For anyone living in poor reception areas an indoor TV aerial is a great buy. It will boost the picture quality you get on your set and save you a lot of money compared to opting for satellite or cable TV. But like with any equipment, finding the right aerial will require a lot of prior research. With the help of this guide, you now have an expert insight on all the variables you will need to help find the ideal indoor aerial for your home. You can browse a full range on Amazon here or check our comparison table above for compare 6 of the best that provide a balance between reception strength, price and functionality.